Heart Patrol Launch Occurred! - ООО "Актив Лайф Технолоджи"
11 January, the city hospital №39 welcomed guest of the press-conference, dedicated to the launch of the program “Heart Patrol”. Heart patrol is an open event engaging the leading neurologists and cardiologists offering workshops on correct blood pressure measuring. Guest may get consultations as well as learn both theoretically and practically about the rules and peculiarities of blood pressure measuring. Such events will be held round the country in February this year. The tough conference schedule embraced the leading Belarusian experts in neurology and cardiology, researches who offered clear explanation of the blood-stroke reasons, cutting-edge diagnostic and prevention methods. All guest could get a feedback, learn about blood-stroke and heart attack, their reasons, as well as receive individual recommendations. 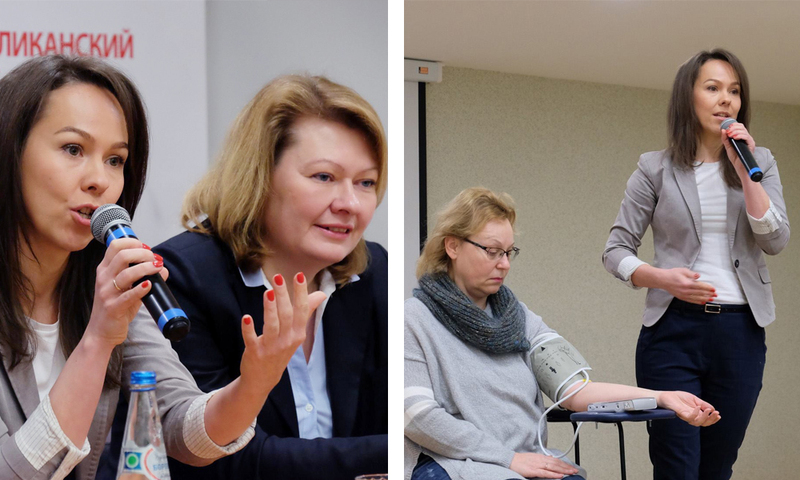 During the press-conference our representatives offered a master-class on correct blood pressure measuring, which is highly topical, due to many people’s mistakes leading to incorrect results. All guest could measure the blood pressure using the new generation blood pressure monitor with the AFIB technology which helps diagnose the arterial fibrillation, leading to blood-stroke in 1 in 3 cases. Heart patrols will march through the district and region centers round the country! See you soon!